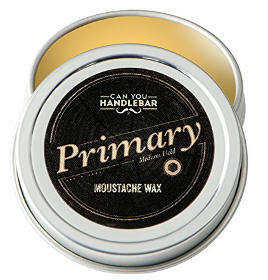 Looking For The Best Mustache Wax? If you want to wear a mustache, then you probably want to be able to keep that mustache neat and well styled with the right mustache wax. While some men just want a well behaved stache, others want a large mustache that they can turn into a head turning style or even enter and win competitions with. Depending on the type of mustache you want and the type of hold you need to create your own awesome ‘stache style, you are going to need the right facial hair products to achieve just the right look. 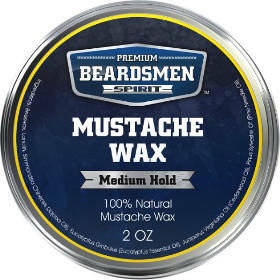 So, if you are looking for the best mustache wax, one of these waxes may be just what you need. This ¨Can You Handlebar¨ Primary Mustache Wax comes in a 1 ounce can that contains safe and natural ingredients such as beeswax, Lanolin, castor oil, shea butter and vitamin E. The hold it offers is a medium hold which is good for holding medium thick mustaches. The wax in the can is quite hard, and the manufacturer suggests sitting the can in warm water before scraping a bit of wax out with your nail and warming it in your hand. Still, some users simply carry the can in their pocket to warm up the wax a bit. Generally talking, they find this product easy to use once warmed and like the fact that it holds well. The ¨Can You Handlebar¨ Secondary Mustache Wax provides men with a stronger hold, making this product well suited for medium long handle bar or Fu Manchu style mustaches to hold their shape. It uses Michigan beeswax, castor oil, Lanolin, Shea Butter and Vitamin E. The can is the right size to carry in your pocket to warm up the wax a bit and the label is waterproof. The ¨Beardsmen Spirit¨ Premium Mustache Wax comes in a 2 ounce tin and contains 100% natural ingredients, such as Jojoba oil and 3 essential oils. 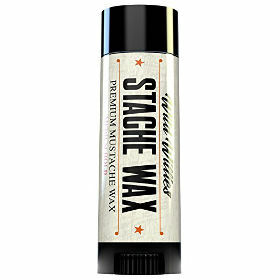 It also has a kind of woodsy scent and is designed to protect your ‘stache from weather. It offers a good medium hold and helps add shine to your mustache while controlling those stray hairs. Users find that a little of it goes a long way and once warmed, the wax is extremely easy to apply. This is the original Wild Willie´s Mustache Wax (handmade in Georgia-USA) that comes in a ½ ounce tin, and offers a strong all day hold, making it perfect for almost any ‘stache style. It has a cedar/pine scent and contains 7 organic and natural ingredients. A little of this product goes a long way and it is extremely easy to use. 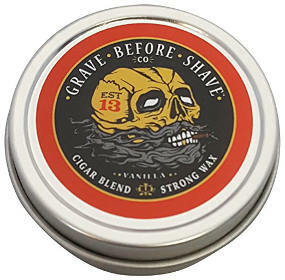 The Fisticuffs Cigar Blend Strong Hold Mustache Wax comes in a 1 ounce tin and provides a medium firm hold while adding shine and being easy to apply. It contains beeswax, Tea Tree oil, Jojoba oil, petroleum jelly and Pine sap. Surprisingly, many people actually like the cigar scent. They also say that it is easy to apply once warmed up a little. 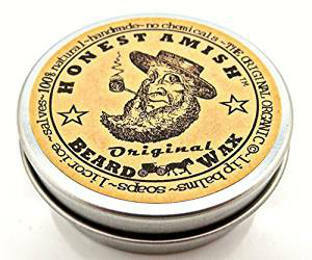 Although this Honest Amish Original Beard Wax is designed for keeping beards under control, it works great on mustaches as well. Made in the USA from all natural and organic ingredients, it softens and conditions beards and mustaches to leave them feeling softer and less scratchy to those who get close to you. This wax comes in a 2 ounce container. It is easy to put in and easy to wash out. Users really like that it controls facial whiskers and say it is good for the skin, too. 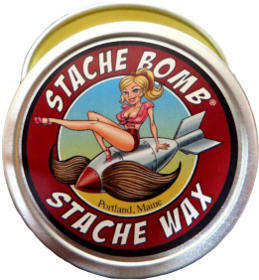 This Stache Bomb Stache Wax is made in Maine and has a woodsy pine scent. It comes in a 1 ounce container and is easy to warm by carrying it in your pocket. Users find that this mustache wax offers them a light to medium hold and is best used for controlling those stray facial hairs. It has a nice light scent and works well on beards as well as on mustaches. 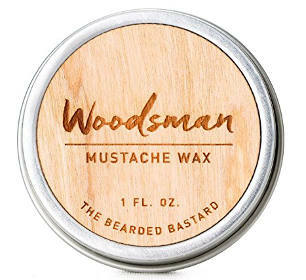 The Woodsman Mustache wax is made in Texas and comes in a 1 ounce container with a nice woodsy scent. It is handcrafted and easy to use. Best of all, it holds well for long periods of time and a little bit of it goes a long way. This product is made with some great ingredients including beeswax, cocoa butter and jojoba oil. It also contains cedarwood, sandalwood and pine needle essential oils. This Fisticuffs Mustache wax comes in a 15g tin that fits perfectly in the pocket. It has a nice citrus/Rosemary scent and is easy to use. Also, it doesn’t discolor your ‘stache and a little bit goes a long way. Users review that their mustache is much easier to style when using this product and state that it controls stray hairs really well. 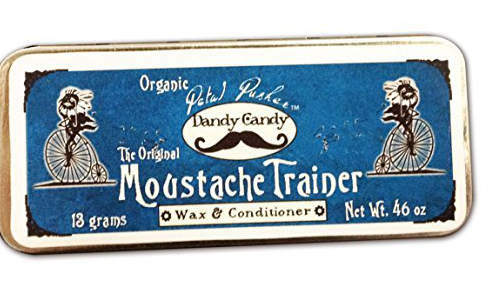 The Dandy Candy Mustache Wax is petrochemical free and provides a medium hold for your ‘stache. It is firm without being still and helps hold most mustache styles. It is made from organic beeswax and contained in a practical slider tin. Users mention that it has a nice bay rum,not too over powering, and is easy to use. 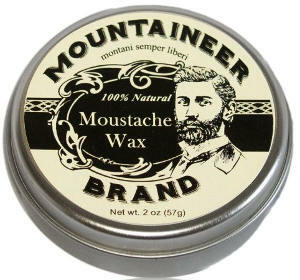 This Mountaineer Mustache wax comes in a 2 ounce container and contains all natural ingredients such as coconut oil, beeswax and essential oils of cedar and fir needle. It has a neutral clear tint and a mild scent of fir needle and cedar that doesn´t linger all day. Furthermore, it is handmade in Virginia. Users like its scent and report that it holds well without being too stiff. It is also easy to apply. 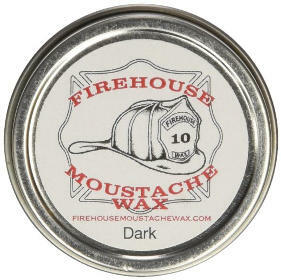 The Firehouse mustache wax was invented by a real fireman. It is dark colored making it suitable for men with darker hair. In addition, it comes in a 1 ounce container and offers a superior hold even in humid conditions. You just need to use it at room temperature. Finally, it is made in the USA. Users feel it holds extremely well and is easy to apply. 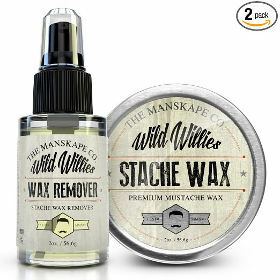 This Manskape Wild Willies Stache Wax to Go can really go anywhere. It comes in a small chapstick style and size tube, and contains some great ingredients like 7 butters, carrier oils and essential oils that contain plenty of vitamins. Made in the USA, this product keeps stray hairs under control. It is extremely simple to apply and isn’t at all messy, which many users like. You can apply it straight from the tube. 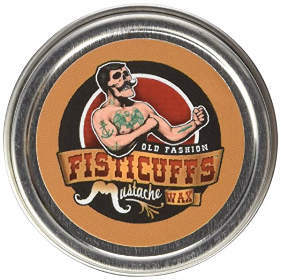 The Fisticuffs Strong Hold Mustache wax comes in a 1 ounce container and offers a strong hold and a nice citrus scent. It is made from beeswax, Tea tree oil, Jojoba oil, Petroleum jelly and Pine sap. Users like that it keeps their whiskers out of their mouth and those stray hair under control. 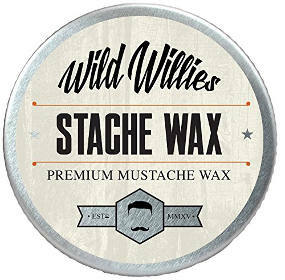 The Wild Willies Stache wax and Stache Wax remover both come in 2 ounce containers and are handmade in the USA. This combo uses sweet almond oil, pine resin, Tea Tree Oil and Rosemary essential oil as part of their ingredients and is free of preservatives, colorants and chemical fragrances. Users like that the wax remover not only helps remove the wax, but also conditions the mustache and the skin of the lip. It blends into the mustache well and provides a good hold. 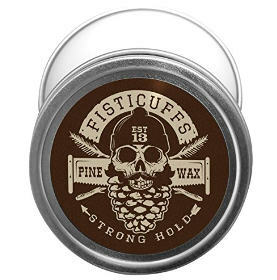 The Fisticuffs Pine Scented strong hold wax comes in a 1 ounce container and contains beeswax, Tea tree oil, petroleum jelly, pine sap and more. It has a nice scent, not too overpowering, and offers a strong hold. It goes on smoothly and is easy to apply. 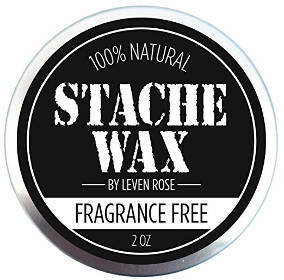 This Leven Rose Mustache and Beard Wax comes in a 2 ounce container and is fragrance free. It is designed to groom unruly facial hair and works equally well on both your mustache and your beard. It contains 100% natural ingredients such as beeswax, Shea butter, Castor oil, Avocado oil and Argan oil. It not only helps condition your facial hair, but also the skin underneath. Users like that this product helps to heal dry, itching skin and keeps their stray hair in check. All in all, depending on the hold you want your mustache or beard to have and a few other details that make a difference in people’s preferences, in this review we have selected a large variety of top quality mustache waxes with some great reviews.